Usain Bolt, chinning Russell Brand, and what do we mean by winning? August 13, 2012 9:06 am / 6 Comments on Usain Bolt, chinning Russell Brand, and what do we mean by winning? 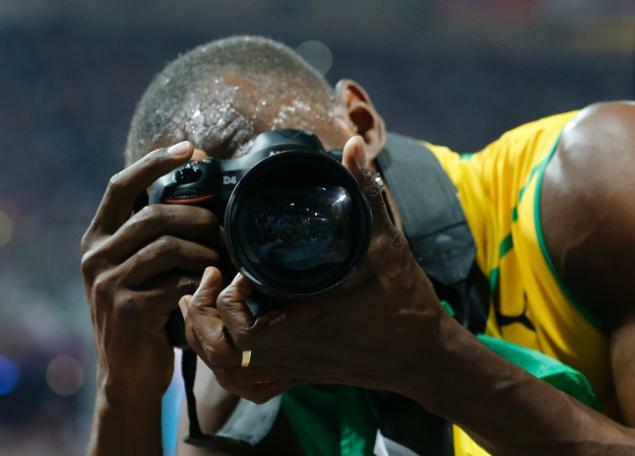 Everyone loved Bolt’s one-eyed long lens. Who’s the fastest person in the world? If you said that Bolt cove then damn your eyes and call yourself an Englishman? It is, of course, Stephen Kiprotich from Uganda, who spanked everyone else in yesterday’s Marathon. Fastest man in the world over twenty six miles and change. I’ll tell you something else: it’s also Michael Phelps, at least over 100m in water doing the butterfly. It’s also Victoria Pendleton, as long as you’re talking about the women’s (or ‘girls’ as commentators prefer to describe them, as if they were a clutch of spinsters descending on a tearoom, or Miss Jean Brodie’s pride) keirin, which I think might be a boy’s name. Oh, I’m sorry, did you mean the fastest man over 200 metres? Or perhaps the man who obtained the fastest unassisted speed at any point in his event? The answer you get depends on the question you ask. But at least there are benchmarks; cornerstones of absolute truth that we can all agree upon. Usain Bolt, you will be relieved to hear me concede, is certainly the fastest man in the world at this point, at least of the ones being measured, unless there’s a very modest postman somewhere with thighs like Treebeard’s middle leg. This might sound a bit ‘Who’s stronger- Spiderman or Captain America?’, but how would he do against Mo Farrah over 5000 metres? Or forced to hammer down a rubberised track, leap short of the foul line and land in a sand pit? When you win, they call you a winner, but what we mean by winner depends on what you mean by a win. In the Olympics, thankfully, such matters of salon philosophy are largely settled (thank Christ, thank Christ; can you imagine Twitter? ‘What do you even MEAN by long jump?’ etc): tracks are length X; competitors start at point Y; first person to chin Russell Brand wins, etc. Newtonian physics and our confidence in length, breadth and absolute time provides clean and clear results. I think this is one of several reasons that the Olympics has been so omnipopular; where else in life do you get such pure narratives of success and striving? Every night for a fortnight we have seen people’s dreams realised or battered in a clear and straightforward way. The criteria for that success has been unambiguous, unless you’re watching Judo in which case a soft voice-over will tell you when someone stumbles. We don’t get this level of clarity in life; we don’t have such fairy tale scales and stopwatches to indicate that this goal has been achieved, or that target has been finally met, resistant to further rebellion. In the world outside the stadium, winning is a far fuzzier concept. 100 metre races end but life does not. There is a reason why fairy tales close with ‘Happily Ever after. The End.’ Because no one wants to read a story about what they had for dinner the next day (unless you’re a user of Instagram) or how tired they were when they had to feed the baby (unless you’re on Facebook). And this points us, finally (I promise I will always Steve Cram education into these blogs) to what we mean by a successful school. When does a school win? Or a student? Whatever criteria you create, that is what institutions will strive to resemble, like plasticine. Jessica Ennis was not worried about the artistic points she would achieve from the angle of her foot or the vigour of her smile as she bossed the hurdles, because there weren’t any. (Usain Bolt of course, was mugging it across the digital ticker tape, but he’s a cocky showman with talent to burn. There are always exceptions, thank God) When you reduce success to a league table composed of one plane, or two planes, then don’t be surprised if schools stop doing anything other than that plane; or if every other endeavour becomes servant to it. It’s a horrible, anti-life state of affairs, but it’s what you get. I think people were a bit confused by the closing ceremony, because nobody knew if it was good or not. We didn’t have a benchmark we could relate it to. Were the Pet Shop Boys fast enough? Did Boris Johnson win the Tory VIP dance-off, or did D-Cam steal it by a soft white belly? What about those moments when the organisers thought that world-class stadium entertainment meant piping recorded music over pictures of David Bowie while Pan’s People built a tiny ziggurat out of polystyrene? Was that like the diving? We all want kids and schools to win. But what’s a win? The Games are over. Let the Games begin.